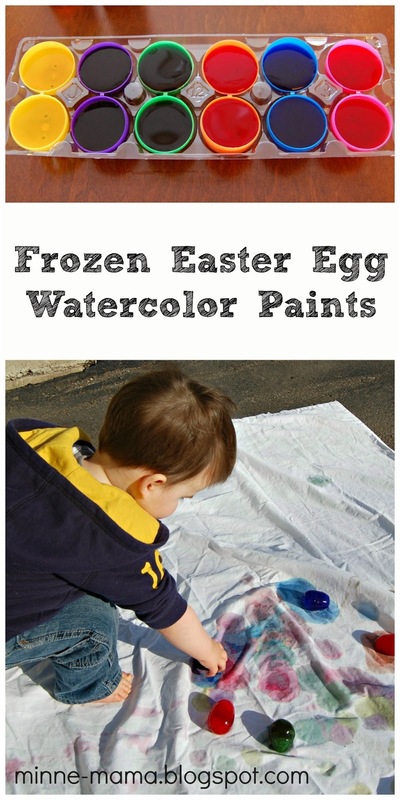 Trying to find another use for my new favorite crafting item, liquid watercolor paints, I wanted to try making shaped frozen paints using plastic Easter eggs. Perfect for one of the first very warm days we have had in Minnesota in months!! Our plastic eggs have holes on the top and bottom, so to cover them up I just put a dot of hot glue on each hole. 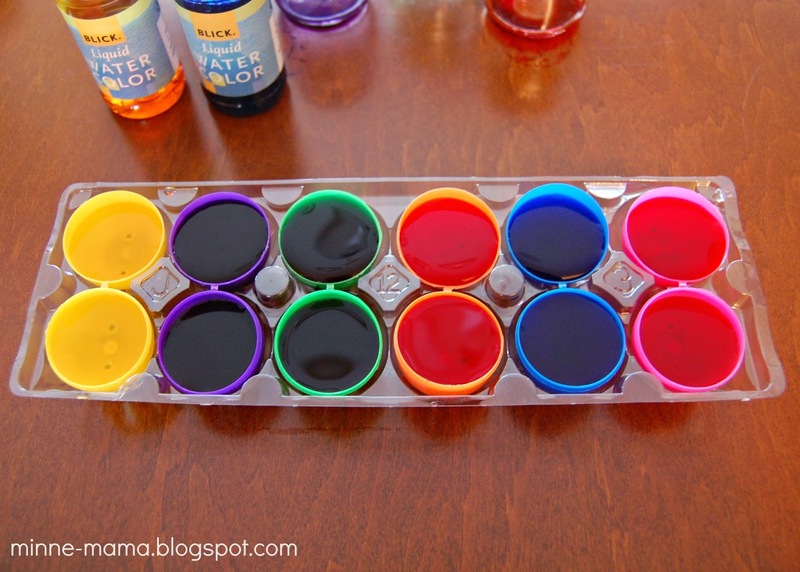 It took just minutes for the glue to dry, and then I could make our paints! The perfect way to hold six eggs in halves was, of course, an egg carton! 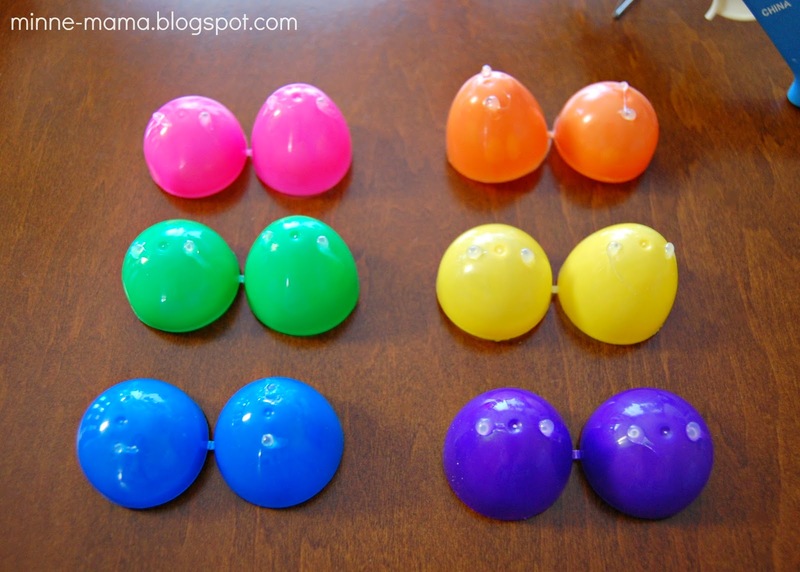 I put several drops of each color into the corresponding egg halves and then added water to the tops. I worried that I didn't add enough of the colors, but they did end up very vibrant - you don't need much of the liquid watercolor! After leaving them to sit overnight in the freezer, I went back and added some water to the tops and folded the eggs together to adhere the halves and make the full egg shape. They only had to sit for an hour or so, and the eggs were very well held together. 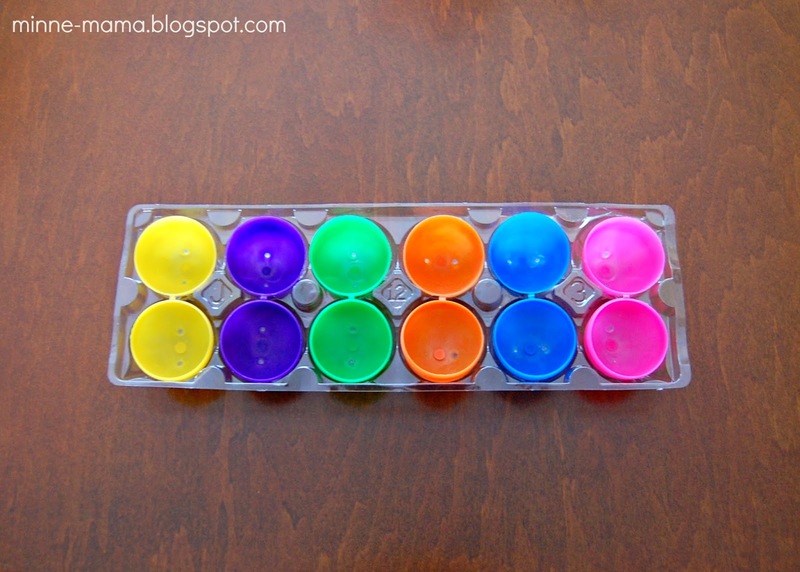 To pop our frozen paints out of the plastic eggs, I held the plastic under warm water and ran a butter knife around the edges. The paints do melt pretty quickly in the warm water, but the egg shapes still came out really cute! It was pretty windy out, so the sheet didn't lay completely flat, but the colors looked beautiful on the bright white. 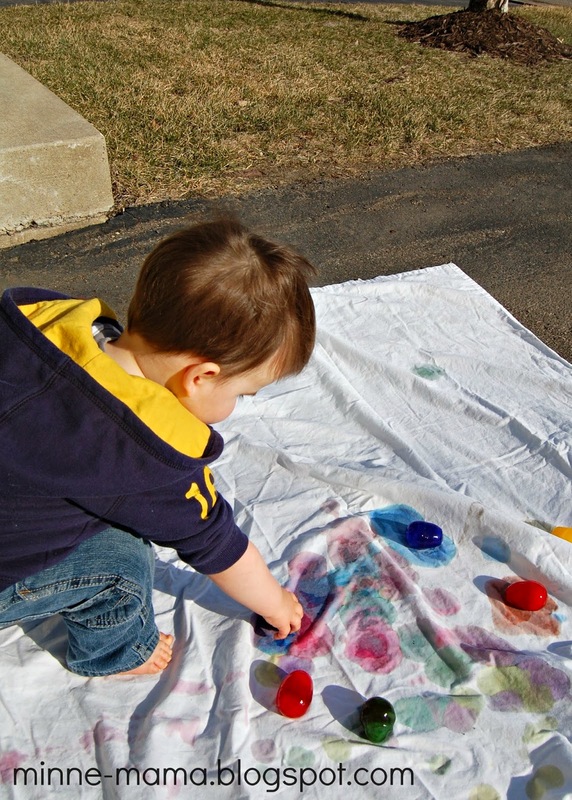 Skyler was quite confused about the cold feeling of his paints, but did like rolling them around and getting the colors to mix. I thought the eggs would be completely melted when we were finished, but they were still intact after our play, so I returned them to the egg carton and back into the freezer they went! I think we will try them with paper on our dining room floor (like our rainy day drip painting) tomorrow. These paints were a lot of fun. 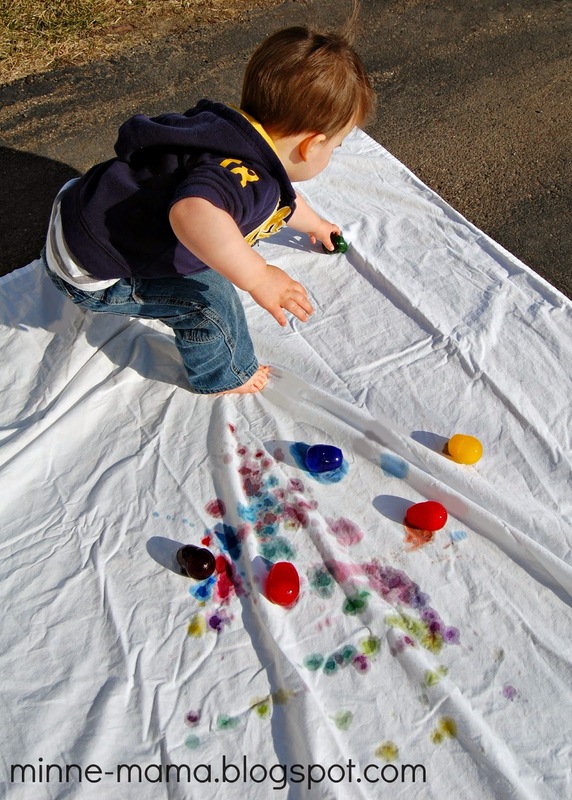 The cold and slippery paints, the egg shapes and vibrant colors, and our giant makeshift 'canvas' made for a unique painting experience!